Oak Hills scores the game-winning touchdown with just under two minutes left in the game to defeat East Central, 28-21, at home Friday night. Oak Hills senior Ethan Myers found junior Aaron Frick on a 10-yard pass to take a 28-21 lead. This came after East Central Devon Donawerth returned a punt 74 yards for a touchdown to tie the game at 21-21 with just over nine minutes left in the game. Myers led Oak Hills with 171 passing yards, three touchdowns and an interception. Senior Jacob Berkemeier caught five passes for 99 yards and two touchdowns. It took until the second quarter, but East Central opened the scoring when quarterback Alex Maxwell scored on a one-yard keeper. Oak Hills answered when Myers found Berkemeier on a 21-yard touchdown reception. Maxwell found the endzone for the second time on a seven-yard keeper to take a 14-7 East Central halftime lead. Oak Hills controlled the third quarter scoring two touchdowns. One touchdown was a 42-yard pass from Myers to Berkemeier, and then Myers had a one-yard keeper with just under three minutes left in the third quarter. As mentioned earlier East Central tied the game on the punt return in the fourth quarter, and then Myers found Frick for the game-winning touchdown. Oak Hills outgained East Central, 300-215, and outrushed East Central, 129-88. Junior Sebastian Bachler and senior James Patrick each recorded seven tackles, which led the Oak Hills. Maxwell threw for 127 yards and rushed for 58 yards and two touchdowns. Eric Rosemeyer led East Central with three receptions for 50 yards. Bret Fox and Kole Viel led East Central with nine tackles. Fox also recorded the only sack for East Central. 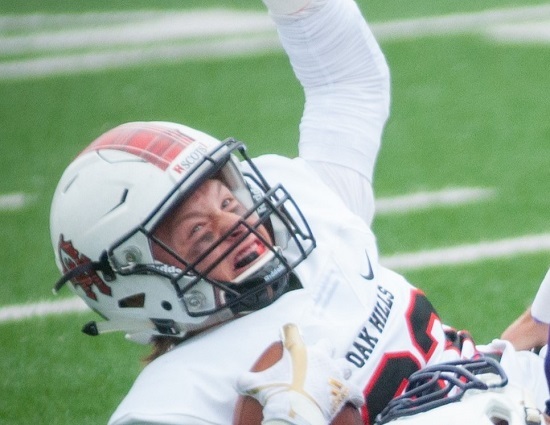 This is the first time Oak Hills won their season opener since 2012 when they defeated Walnut Hills. Next Friday Oak Hills will host Dunbar. East Central will return to Ohio to play Harrison.